To my fellow Psychology professionals as well as students,yes, mga ka-Psych, I graduated Psychology from the Light of the North. See you this April!! The Psychology Department of the Ateneo de Naga University, with its commitment to promote integral and holistic development of the person through providing greater understanding of the self and others, believes that introducing Positive Psychology would benefit teachers, practitioners and students in their pursuit of self-understanding through promotion of effective interventions in building happy life, thus developing happy and healthy people. 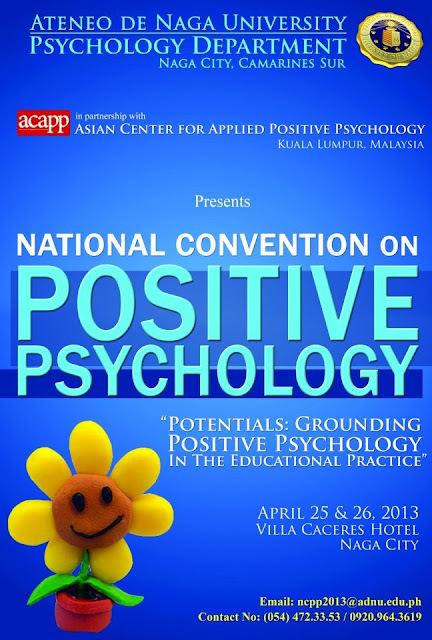 In this regard, the Psychology Department of the Ateneo de Naga University in partnership with Asian Center for Applied Psychology (ACAPP) in Kuala Lumpur, Malaysia, will sponsor the National Convention on Positive Psychology with a theme: “Potentials: Grounding Positive Psychology in the Educational Practice”. The convention will be held on April 25-26, 2013 at Villa Caceres Hotel, Magsaysay Avenue, Naga City. This hopes to bring together both local and national educators, practitioners and students. This event is fully endorsed by the Commission on Higher Education. To maximize your stay in the Bicol Region, we can accommodate you for a one day Bicol-tour. The tour will be on April 27, 2013. If you are interested, you may contact us and present to you the itinerary. We look forward to hearing from you, and that this convention will be the best and happiest in 2013! Do you have any questions regarding the Positive Psychology Convention this April 25 and 26?